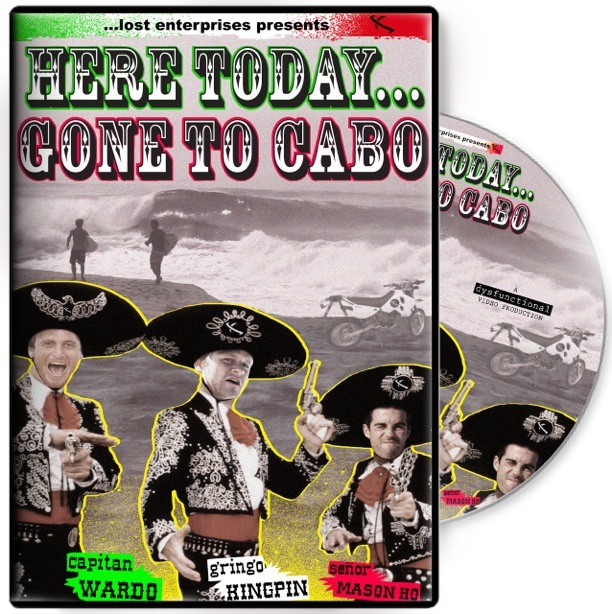 …LOST Video Productions has released its complete online mini-series, “Here Today… Gone to Cabo” on DVD. The three-part series documents Chris Ward and Matt King’s wild journey from San Clemente down to the tip of the Baja Peninsula to join Mason Ho to compete in the 6-Star Los Cabos Open. Follow their journey through Baja and back to see how the pros take a surfing road trip. Every grom should own a copy. Also bonus footage featuring Ward taking on the Hurricane Sandy swell in South Florida and Desert Point in Indonesia. Also included are select sections from Mason Ho’s mini movie, “MhOVIE”. The DVD is available now in select surf shops nationwide. To find out where go to our DEALERS LIST.